The psychological thriller The Lost Village will be released in April, but already the rights have been sold to 15 countries. Even here in Sweden, the buzz is big and the tv- and film rights have already been sold to Nordisk Film. 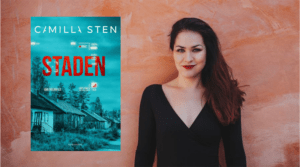 – Camila Sten is a real star and has already created her own unique place on the suspense map. The Lost Village is a real page-turner for anyone who loves a well written psychological thriller, but Camilla is also adding something new to the genre and I feel incredible happy to get to publish her book, says Erika Degard, publisher at Norstedts. The French publishing house Seuil is one of the international publishers who fell for the book. – The Lost Village is an excellent suspense novel with amazing characters. I have not read a thriller this exciting and frightening in a very long time. This is exactly what I was looking for: strong emotions, tension, a well written story with an interesting atmosphere. Camilla’s book will definitely be the highlight of 2020 when it will be published in France , says Bénédicte Lombardo at Seuil. The Lost Village is a nail-biting story about a 60 year old mystery. At the end of the 1950’s a whole village disappeared without a trace in the small mining town Silvertjärn. No one knows what happened. Was it an accident, a mass-suicide or did the town’s new fanatic religious mass movement have anything to do with the disappearance? The theories are many. Alice is a young documentary filmmaker with personal ties to Silvertjärn. Once and for all she wants to find out the truth. But as soon as she and her team arrives to the isolated and abandoned town they start to hear strange sounds, see unexplainable things and odd accidents happen to them. Soon they have to ask themselves if the past really is the past, or if the town will devour them too. Camilla Sten is born in 1992 and studies psychology in Uppsala. Previously she has written the dystopian novel A new dawn. She is also writing a critically acclaimed suspense series for young adults with her mother Viveca Sten. The Lost Village will be released by Norstedts on April 4th in Sweden.